In this four-part series, we are uncovering manhole and handhole conditions. In our experience, asset owners are often surprised at the amount of damage, trespass, and violations found in underground spaces without regular inventories. The first article in the series covered unauthorized trespassers in manholes and handholes, and the second article talked about structural damage. Both of these underground issues are a direct cause of violations, which we will be covering here. There are three main causes for violations: damage, trespass, and third-party contractors. Watch the video below to learn about violations. Based on our own experience from auditing Tier 1 conduit spaces, the three most common violations are illegally moving conduit in handholes, and improper core-drilling and uncapped knockouts in manholes. Illegally moving conduit in handholes is one of the most common trespass violations in the US. In a moved-conduit violation, instead of breaking into the duct outside the vault (like in a manhole space), the foreign occupant will physically move unoccupied ducts to their own vaults. They place equipment in the duct and bootleg the route to the residence. This typically occurs in new residential neighborhoods that have construction. Contractors may be hurried with work, as they struggle to get from one job to the next. Rushed labor typically results in unpolished jobs. An unfinished core-drill is a violation. When done correctly, core-drilling does not cause lasting damage to the vault. But, trespassers or contractors typically core-drill quickly and cheaply to make routes convenient for themselves. Core-drilling can lead to wall damage and roof damage, harming the vault’s structural integrity. It also causes debris, which is a trip hazard for technicians. Another common violation found in manhole and handhole spaces is uncapped knockouts. Knockouts may be left open and uncapped, allowing dirt and excessive water to enter the space. Uncapped knockouts can lead to increased liability, resulting in workman’s comp claims or lawsuits from contractors. Violations and safety seem to go hand-in-hand, one always affecting the other in vault spaces. 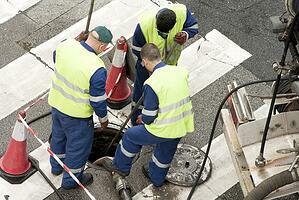 Square footage in manholes is typically small and usually only allows standing room of one person. This small underground space makes following proper safety guidelines crucial. Manhole spaces are small. Leaving unracked cables on the floor or in inappropriate spaces, leaving excessive inner-duct, or illegally moving conduit, can cause serious safety hazards for techs and maintenance crews. Bad practices accrue out-of-sight and out-of-mind to asset owners. Ongoing damage and violations add up. Safety and vault access must work in tandem. Unsafe conditions limit contractor and technician access to vaults, while safe conditions encourage proper service maintenance. Take a look at our next article to learn more about safety and vault access. In the meantime, share your thoughts about underground conduit in the comments below.